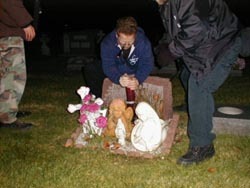 During this investigation of Mt Peace Cemetery we found a tomb stone that was freshly knocked over. Investigator's Juliano and Huber put the stone back in place. We do this often if the size of the stone is something we can lift and as long it will not damage the stone in the process. This stone was covered with heavy growth. Many of the veteran graves here are not care for and are buried in woods and vines worse than this one. SJGR has begun to volunteer their time to help out the local citizens of Lawnside, NJ in cleaning up Mt. Peace Cemetery. Co-Director Anne Palagruto places a flag on a grave of a veteran that did not have one at Mt. 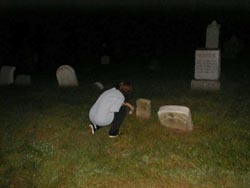 Moriah Cemetery. 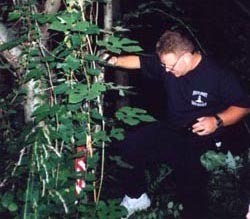 We like to put flags on untended veteran graves and much more in the course of our ghost research. 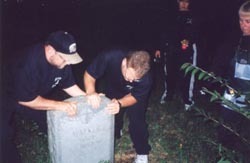 These activities are part of how we respect the people who are buried in these cemeteries. There is a lot more to this than just taking pictures. 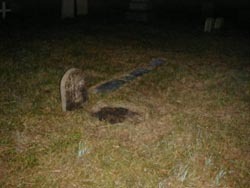 Investigator Wilson uprighted a fallen tombstone at Evergreen Cemetery. If there are ever any stones we can fix or clean off during our investigations, we do so. 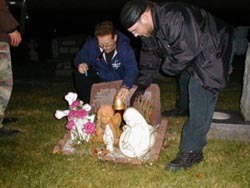 Investigator Huber fixes and lights a candle that had gone out on a grave.